OAKLAND, Calif. (AP) Stephen Curry watched his first 10 shots miss. Even his 11th rattled around the rim a few times before falling in. On a night when Golden State’s offense took nearly 20 minutes to get on track, Curry was determined to get his own game going. The two-time MVP did just that and the Warriors got another big lift from their bench while Kevin Durant sat out again. Curry scored 14 of his 27 points in the third quarter, Klay Thompson added 24 and Golden State held on to beat the New Orleans Pelicans 110-95 on Saturday. Curry scored 26 of his 33 in the second quarter of a blowout against the Chicago Bulls on Friday but struggled for most of Saturday’s game before finding his rhythm coming out of halftime, going 5 of 9 with two 3-pointers. The 0-for-10 start matched the worst of Curry’s career and came as part of a first quarter when the Warriors were held to a season-low 17 points. Curry didn’t make his first shot until 52.8 seconds left in the first half when his 19-foot jumper rolled around the rim three times before dropping in. Draymond Green had six points, seven rebounds and eight assists for the Warriors. Andre Iguodala added 14 points and led a strong effort on the bench. Golden State won its second in two nights without Durant, who sat out for the third time in four games with a sprained left ankle. Anthony Davis had 30 points and 15 rebounds for New Orleans, which had won three straight. Jrue Holiday added 24 points, including 17 in the first quarter. DeMarcus Cousins scored 15 points with seven rebounds. The Warriors pulled away behind Curry and led by as much as 16 before New Orleans cut the gap to 99-93 on Cousins’ second 3-pointer. Curry responded with an 18-foot jumper and the Warriors finished with an 11-2 run. Pelicans: New Orleans committed 17 turnovers. . Omer Asik did not play after making his debut a night earlier. Asik is working himself back into shape after missing eight months with an illness and losing 30 pounds. ”It’s going to be a while before he’s going to be able to play any kind of extended minutes,” Gentry said. 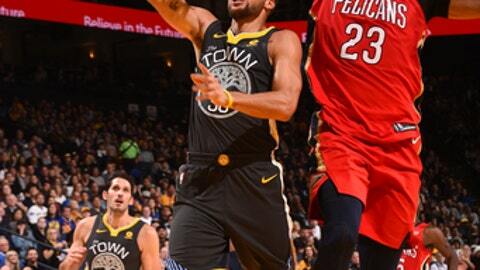 Warriors: Omri Casspi started in place of Durant and had nine points on 4-of-8 shooting. . Golden State has won 10 consecutive home games against New Orleans. … The Warriors have held every opponent under 50 percent shooting this season. New Orleans’ 6-foot-11 center made a stellar play to block Iguodala’s breakaway dunk attempt in the second quarter but had an otherwise forgettable night. Cousins was in foul trouble most of the night, was called for a three-second violation and picked up a technical foul late in the fourth quarter. The six technical fouls ties Cousins with Green for most in the NBA this season. Former Warrior and current Pelican Ian Clark received his NBA championship ring from Curry during a pregame ceremony. Clark spent two seasons with Golden State and was greeted with a loud ovation from the Oracle Arena crowd. ”I’m just going to see if his ring is bigger than mine,” said Gentry, who was an assistant on Kerr’s staff when the Warriors won the title in 2014. Pelicans: Visit Minnesota on Wednesday.